"Unless you are putting it inside your PowerBook, be sure to get a FireWire 800 enclosure for your new 2.5" 7200 rpm drive. The 4200 rpm and 5400 rpm notebook drives don't go any faster in FW800 mode than they do in FW400 mode. But the 7200 rpm notebook drives are a different story. By moving our 2.5" 7200 rpm Seagate Momentus 100 GB drive from a FW400 case to a FW800 case, we gained 15% in read speed and 26% in write speed. Compared to the 5400 rpm drive in a FireWire case, we gained 28% in read speed and 37% in write speed. Take a look and read our full review of the Seagate Momentus." "Toshiba will this week demo a slimline optical drive for notebook computers that will provide an HD DVD playback capability. "In addition to HD DVD playback, the drive supports 8x DVD-ROM, 24x CD-ROM, 3x DVD-RAM, 4x DVD-R/RW, 4x DVD-R dual-layer, 4x DVD+R/RW, 2.4x DVD+R dual-layer, 16x CD-R and 10x CD-RW - so it's got every format covered except Blu-ray, natch." "LG will be the first company to commercialise a portable fuel-cell system for notebook computers within a year, the company has pledged. "Developed by LG subsidiary LG Chem, the fuel cell comprises a reaction vessel and removable 200cc methanol fuel reservoir. Together, they can generate 25W of power for more than ten hours. The cell itself lasts for more than 4000 hours - eight times longer than competing products, LG Chem claimed. "Designed for notebooks, the fuel cell will also be able to power handheld devices such as portable media players and mobile phones, LG Chem said, by connecting to their USB ports." "Massachusetts Gov. Mitt Romney wants every middle and high school student in the state to get a laptop computer. "Under a plan Romney proposed last week, Massachusetts would also add 1,000 new math and science teachers by creating a teaching corps to encourage students to enter those disciplines. He said the proposed bill, which includes other education initiatives, would improve the national and international academic standing of Massachusetts students." "Hard-disk drive technology is anything but dead and isn't in danger of being replaced by memory chips anytime soon, an executive of drive-maker Seagate Technologies says. "The comment, perhaps not surprising given that hard-disk drives are Seagate's bread-and-butter, were in response to a prediction made by the head of Samsung's chip division that flash memory is on course to replace other forms of data storage technology, especially in portable devices. "'When Samsung said hard disks are dead, I think they were being completely irresponsible, extremely short-sighted and simply weren't telling the truth,' said Rob Pait, director of global consumer electronics marketing at Seagate, in an interview at the Ceatec Japan 2005 trade show here. 'It may be that one day flash memory will be all that we need, but one day we will be able to take tourist trips to Mars.'" "The latest Apple iBook (12-inch) may look the same on the outside, but some significant changes inside make it all the more impressive. Upgrades like a processor bump, added hard drive space, and more memory, along with several features passed down from the PowerBook - like a scroll touchpad and hard drive protection - greatly boost the Apple iBook's value, especially considering that the price remains the same low $999." "You can't judge a book by its cover, but you can certainly judge a notebook by its price tag - even when it comes from Apple. While there are several brand-name notebooks cheaper than the iBook, few are better. This was never more so than with the latest version of Apple's laptop, which is essentially last season's model with every 'optional upgrade' box ticked. The result is a lot more dash for your dollar. "Previous iBooks were rightly criticised for their meagre 256 MB of memory which seriously hobbled the notebook's performance in even day-to-day tasks, but with this now doubled to 512 MB, the new machines turn zzzz into zoom." PR: MCE Technologies, LLC has added a 100 GB hard drive with a fast rotational speed of 7200 RPM to their MobileStor line of PowerBook, iBook and Mac mini hard drive upgrades. The MCE MobileStor 100 GB/7200 RPM drive is the highest performance drive available at the 100 GB capacity for the Apple PowerBook and sports an 8 MB cache buffer. The drive has a suggested retail price of $399 and is available for immediate shipment. "Our new MobileStor 100 GB/7200 RPM drive is the ideal pairing of speed with capacity and makes light work out of any data intensive task the PowerBook G4 might give it during video editing, DVD creation, image retouching or otherwise," stated Arnold Ramirez, president of MCE. The MCE MobileStor 100 GB/7200 RPM PowerBook hard drive upgrade is compatible with all Apple PowerBook G4 models, and can also be installed into any iBook G4, PowerBook G3, iBook G3, and Mac mini models. The MCE MobileStor 100 GB/7200 RPM PowerBook hard drive's most impressive feature besides its sheer capacity is its rotational speed of 7200 RPM. This gives the drive the ability to have sustained data transfer rates of over to 75 MB per second with burst transfer rates of up to 100 MB per second. The drive is also designed with an 8 MB read and write cache buffer. This allows the drive to anticipate which data will be requested next by the PowerBook, and the drive will preload this data into its high-speed buffer. If the PowerBook does request this preloaded data then the drive responds immediately, transmitting the data from its super-fast memory buffer, completely eliminating the latency involved in having to search for the data on its disk. The larger the cache, the greater chance the data will already be preloaded. Since most drives include only a 2 MB buffer, the MobileStor 100 GB/7200 RPM's 8 MB buffer gives it a further performance advantage. The MobileStor 100 GB/7200 RPM drive's fluid dynamic bearing technology reduces acoustic noise by up to 20% over drives without this feature. The drive also features a low-power idle mode to help conserve PowerBook battery life during non-hard drive intensive activities. The MCE MobileStor 100 GB/7200 RPM PowerBook hard drive upgrade has a suggested retail price of $399 and includes an illustrated installation guide and an installation kit containing the tools needed to properly install the drive. More information can be found online. 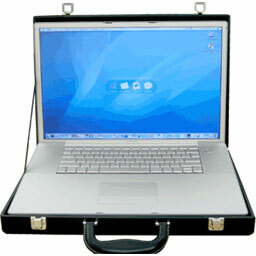 PR: MaxProtect II is an impact resistant rigid case for the PowerBook 17/15/12 inch models, its unique design offer maximum protection against shock and impact by restricting the movement of the laptop by providing just fit cushioned interior space for the PowerBook.